Zacharias Chrysopolitanus (d. c.1155) was born at Besançon in France, where he was headmaster of the cathedral school, before becoming joining the Premonstratensian order at Laon. This Gospel harmony is his main work: its variant titles, such as 'One From Four' show its purpose: to produce a single seamless account out of the four differing Gospels. 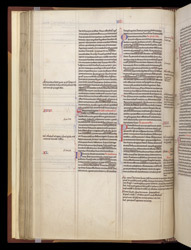 This manuscript was owned by Worcester Cathedral Priory by the 14th century. Book II of the work is introduced by this initial 'E', of a type which is sometimes called a 'puzzle' initial, because it is made up of two differently coloured parts which interlock like the pieces of a jigsaw puzzle.